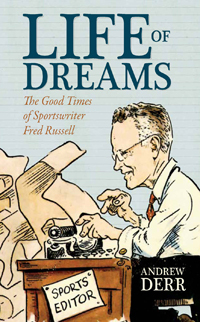 Life of Dreams is the first complete biography of Fred McFerrin Russell, one of the all-time stars in sports journalism. This biography details how the Vanderbilt man started with the Nashville Banner in the late 1920s, ascended to Sports Editor and remained with this paper loyally for sixty-nine years. He led the daily charge against the better-funded Tennessean, and it was a fierce rivalry for decades until the Banner folded in 1998. Russell’s early success led to a position with the nationally recognized Saturday Evening Post, and from 1949–1962, he was the annual voice of college football with his immensely popular “Pigskin Preview.” He built long-lasting relationships with coaches, players, and other writers in the business, and Russell wrote with a style that reflected his personality: fair, informative, and always with a sense of humor. He was a storyteller, whether it was athletes such as Bobby Jones or Red Grange; or coaches such as Red Sanders or Paul “Bear” Bryant, one of his closest friends. Outliving almost all of his contemporaries, Russell rubbed elbows with some of the greats of the twentieth century, with men such as Sparky Anderson, George Steinbrenner, Archie Manning, Vince Dooley, and Lou Holtz. One of the unique elements of this biography is the Russell legacy and the connection that exists between Russell’s past and the sportswriters of today and the future. Two years after Grantland Rice died in 1954, Russell helped to organize the Grantland Rice Scholarship, a four-year sportswriting scholarship awarded to an entering freshman at Vanderbilt University.